Literary Territories introduces readers to a wide range of literature from 200-900 CE in which geography is a defining principle of literary art. From accounts of Holy Land pilgrimage, to Roman mapmaking, to the systematization of Ptolemy's scientific works, Literary Territories argues that forms of literature that were conceived and produced in very different environments and for different purposes in Late Antiquity nevertheless shared an aesthetic sensibility which treated the classical "inhabited world," the oikoumene, as a literary metaphor for the collection and organization of knowledge. This type of "cartographical thinking" stresses the world of knowledge that is encapsulated in the literary archive. The archival aesthetic coincided with an explosion of late antique travel and Christian pilgrimage which in itself suggests important unifying themes between visual and textual conceptions of space. 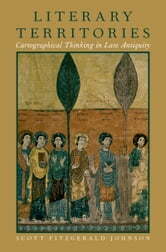 Indeed, by the end of Late Antiquity the geographical mode appears in nearly every type of writing in multiple Christian languages (Greek, Latin, Syriac, and others). The diffusion of cartographical thinking throughout the real-world oikoumene, now the Christian Roman Empire, was a fundamental intellectual trajectory of Late Antiquity.